Mrs. Mattie Lee Rogers was born on July 28, 1923 to the parentage of the late Edgar Vance, Sr. and Mary Sue Wilson-Vance in Henderson, GA. She was the second oldest of nine children. She attended the Henderson School System. At an early age, she accepted Jesus Christ and joined Friendship Baptist Church in Henderson, GA.
Later in life, Mattie was joined into holy matrimony to the late Eddie Rogers and she transferred her membership to Mt. Zion C.M.E. 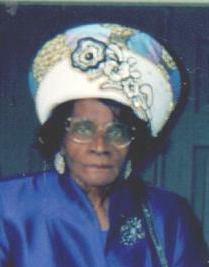 Church in Perry, GA. She was employed as a Housekeeper and Home Care Attendant for many years. Mattie was a loving, hardworking mother that believed in instilling morals and good work ethics into all of her children and grandchildren. She was also well known for her delicious sweet potato & peach pies. She was preceded in death by her parents: Edgar Vance, Sr. and Mary Sue Wilson-Vance; her brothers, Hartman Vance, Mark Vance, Sr. Marvin Vance, Edgar Vance, Jr., Willie Frank Vance, Major Vance and Cornelius Vance, Sr.; her husband, Eddie Rogers; and her children, Bland Edwards, Jr. and Daisy Gray. Mattie leaves to mourn and to cherish her memories to her loving sister, Annie Ruth Vance of Houston County, GA, caring daughters, Clifford Haslam, Helen Rogers, Annie Kate Rogers, Mary Jackson, Janie Washington, Betty Rogers and Louise Rogers all of Houston County, GA; sister-in-law, Josephine Rogers of Macon County, GA; brother-in-law, Lonnie (Marilyn) Rogers of Macon County, GA and 26 grandchildren. A host of great grandchildren and great-great grandchildren along with nieces, nephews and other relatives and friends including Louise Rumph and Betty Bradford, her devoted friends.